A suspect smashed into the patrol car of a San Diego County Sheriffs deputy during a pursuit in Lemon Grove early Friday morning. 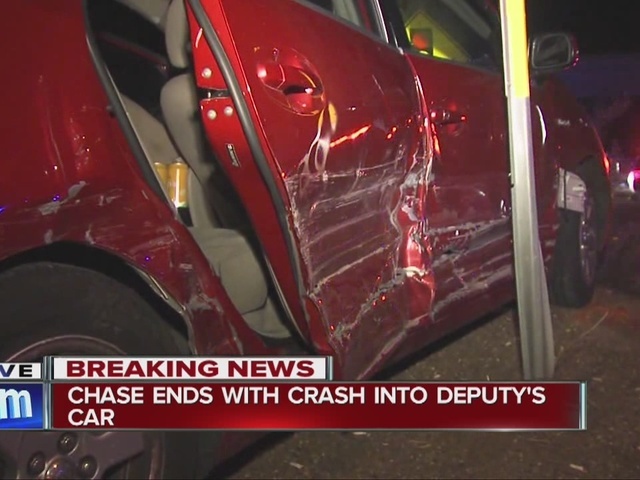 SAN DIEGO – A suspect smashed into the patrol car of a San Diego County Sheriff’s deputy during a pursuit in Lemon Grove early Friday morning. Sometime around 3:30 a.m., deputies attempted to stop a red Toyota Prius on Broadway. The car refused to pull over and a short chase ensued. In the area of Broadway and Campo Road, the Prius collided into a deputy patrol car and then crashed into a guard rail, the sheriff’s department said. The driver jumped out and ran. It took about 30 minutes for deputies to find the suspect. A deputy K-9 discovered him hiding behind a car dealership. The deputy whose car was struck was not seriously hurt. The car sustained minor front end damage. Drugs were found in the Prius, the sheriff’s department said. Deputies are investigating whether the driver had a passenger with him. The suspect’s name was not released. Deputies did not confirm why they initially attempted to stop the Prius.